Dimensions: 25.6" x 14.2" x 21.6"
When you talk about the Silentaire Sil-Air 100-24 Compressor, you mean one of the most powerful devices from Silentaire Technology. It's worth mentioning that the company is the leader in the manufacturing of quiet compressors that are in demand all over the world. About a 50 year-long history and modern production methods allow the company to produce high quality and dynamic products. Moreover, the company constantly carries out researches and works on the improvement and development of their compressors. As a result, many satisfied customers enjoy working with Silentaire compressors that are extremely low in noise level, highly efficient and reliable in operation. Besides, Silentaire Technology also specializes in the production of different accessories, spare, and maintenance parts you may need for your Silentaire compressor. The compressors of this line are unique in terms of their silent and completely automatic operation. If you compare the sound of a running Sil-Air compressor and that of your fridge, there won't be any difference. And as it has been said already, these compressors offer fully automatic work. Otherwise speaking, you won't have to keep watch over the air pressure and temperature within your compressor air tank. A pressure switch will complete this task for you. As the pressure grows up to a maximum level, the switch will automatically stop the compressor motor. Then, after the pressure goes down to a minimum level and the temperature falls, the switch will also automatically start the motor again. a handle or built-in wheels providing balanced carrying and easy rolling of Sil-Air compressors. 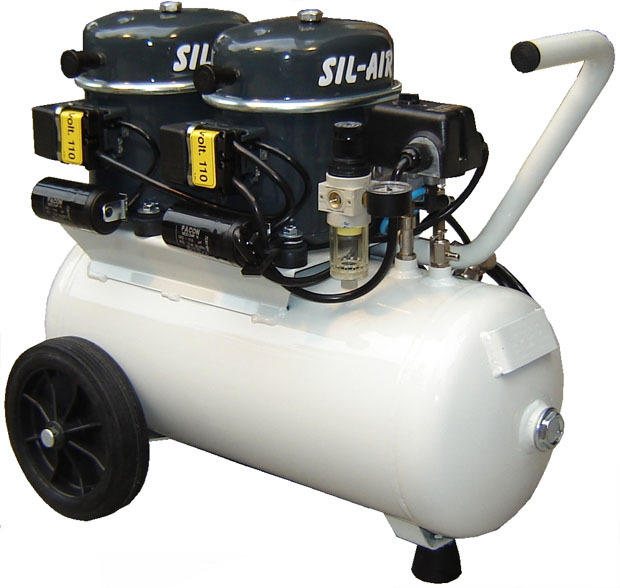 The first thing that comes to mind about the Sil-Air 100-24 Compressor is, of course, its two powerful motors. In addition to it, this compressor model is trolley-mounted. Which means that notwithstanding its heavy weight and quite a big size you'll have no difficulty with moving it around. Separately, it's worth mentioning that due to the timely maintenance and appropriate usage you can support the high level of performance and prolong the life of the compressor. Additionally, the packing contains an oil bottle type ROLOIL - SINCOM/32E, instruction manual, and a tank certificate. The 12 months manufacturer's guarantee gives you the right to get free repairs and replacements of compressor defective parts. However, we want you to note that only the manufacturer can recognize parts as defective. If there is any evidence of tampering or bad usage, the guarantee will automatically cease. Besides, the electric parts and worn parts are not under this guarantee. 32" x 24" x 15"